I finished blue tonight on Double Retrospect Section "A". My next color is orange and that will complete images 2 and 3. Total time to date 60hr. My guess is that I have no more than 30 hours left but more likely 24. 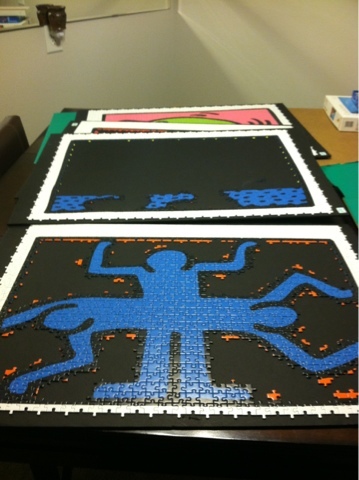 So this would put the estimated time to complete the entire puzzle at 84x8 = 672 hours. This would be equivalent to working a full time job for nearly 17 weeks. My puzzling rate for this puzzle is roughly 48 placements an hour which is about half of my normal rate of 100pieces an hour. Blue completed in section "A"